Home News Who owns the internet? The debate isn’t only between different types of internet user, though. Net neutrality has commercial and political ramifications, too. The behavior of ISPs is under close scrutiny not only from consumers, but from businesses, regulators and governments. On I-Network, a Ugandan ICT for Development forum, the email, “open letter to MTN” generated more than 89 responses in a space of over 3weeks. It started when a frustrated customer decided to express his frustration in an ‘open letter’ that he posted via the forum with thousands of members. The nature of the responses not only exposed weaknesses in Uganda’s largest telecommunications company, but also how much the performance of similar organizations is always under the microscope. To understand the argument of the supporters of net neutrality, think of the road system in your country. (Mine is Uganda. Sorry if yours has a different set up). It doesn’t matter what make, model, size, cost or colour of the car you drive, the purpose of your journey or how much you’ve already used your car that month: the laws of the road are the same for everyone, and it’s up to the government to expand the road network to meet demand rather than discriminating against certain drivers for using the roads more. Supporters of net neutrality argue that the same should apply to the internet. There are some exceptions on roads, though. Slower vehicles such as bicycles, farm vehicles and learner drivers are prohibited from some streets, partly to avoid accidents but also to keep traffic moving. Meanwhile, in some countries, cars with higher CO2 emissions pay more road tax, and those who drive pay more in fuel tax. The detractors of net neutrality believe that some management of how the internet is used is essential to provide a fair, reliable, and commercially sustainable service for everyone. The issue largely stems from how we use and pay for internet. Most people choose an ISP based on just two figures: the quoted download speed and the price. However, it doesn’t really cost an ISP any more to provide its customers with a 512kbps or 2Mbps connection if the hardware is in place. The ISP’s running costs depend on how much data its customers upload and download at the busiest times of day. Let’s imagine that an ISP has 100 customers in a particular neighbourhood, all on a 10Mbps deal. The ISP would need a 1Gbps connection from the local exchange to the rest of the internet to guarantee every customer 10Mbps performance. However, people don’t download data constantly. They only want fast performance for a few moments when they click on a link or file to download. Let’s say that, during the busiest period, each of the 1000 users downloads an average of 50MB of data in an hour. That’s about 30web pages and a couple of YouTube videos. As long as the overall load is spread evenly across the hour, the entire demand for those 1000 customers works out at just 11.1Mbps. This means that the 1Gbps connection could accommodate 9,000 customers, not 100. It would be daft for an ISP to invest in an infrastructure that can handle 90 times more data than is typically required, just in case everyone decides to download at the same time. As such, ISP’s hardware is designed for typical demand rather than guaranteed performance. However, customers who use their internet connection a lot – for video-streaming or file sharing, for example – are far more expensive for the ISPs to accommodate that other users. Someone who spends an hour downloading movies using BitTorrent at 8Mbps will use the same bandwidth as 72 people doing some light browsing. ISPs need to make a profit, and they don’t want some customers costing them many times more than others. However, opinion is divided as to what they should do about it. Most ISPs, including our own MTN and Orange put a cap on the monthly data allowance for each customer. Data caps for our local ISPs range from 500MB to 10GB, although in Europe, 10GB can be the minimum, going to as much as 100GB as the highest cap. However, caps are unappealing to customers and they don’t necessarily stop congestion at the busiest times. That is why many ISPs also use traffic management, which throttles the speed of demanding activities to maintain performance for others. Some form of traffic management may beinevitable, but there are some instances whenISPs have resorted to underhand tactics intheir bid to keep infrastructure costs down. In 2007, an investigation by Associated Pressrevealed that Comcast, America’s third largest ISP was using a technology called Sandvine tointerfere with file-sharing traffic. File-sharingnetworks have a reputation for being hivesof stolen material (Rapidshare, for exampleis said to have “everything”), but they’re alsoused to disseminate Linux distributions andother open-source software. The problem isthat file sharing also creates lots of traffic. With Sandvine in place, whenever aComcast customer tried to share a new file(known as seeding), after a few seconds theSandvine system would pretend to be theuser accepting the upload and send a resetmessage to say he no longer wanted the file,which halted the upload. The civil liberties group, Electronic FrontierFoundation (EFF) took issue with Comcastnot only for blocking the BitTorrent protocolused by file sharing applications, but forthe way it did so. “One objective aspectof Comcast’s conduct is that it is spoofingpackets,” says an EFF spokesperson. 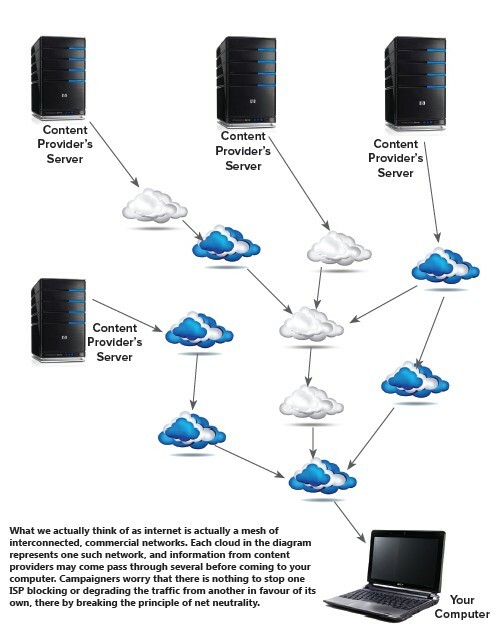 “Comcastis essentially deploying against its owncustomers techniques more typically usedby malicious hackers… It is true that somebroadband users send and receive a lot moretraffic than others, and that interfering withtheir traffic can reduce congestion for an ISP.This does not imply that protocol specificpacket forgery is a necessary orlegitimate means of responding tothe congestion; there are some morereasonable mechanisms available toISPs to ensure that low volume usersare not crowded out by high volumeusers. ”The EFF’s report on the affair(tinyurl.com/EFFcomcast) had this tosay: “A Comcast representative toldus that while Comcast did perform‘network management’ that mightinterfere with particular subscribersin rare circumstances, it did not blocka target any application or protocol. ”This clearly wasn’t true.In Germany last year, T-Mobilecame under fire for blocking Skypetraffic. In some cases, it left userswithout a phone service, butaccording to one campaign group,the argument that it was done to protect available bandwidth doesn’thold water. The issues surrounding trafficmanagement and net neutralityaren’t limited to the conflictinginterests of ISPs and its customers. Insituations such as the Iranian election, the very nature of the internetcomes into question. Is it simplya commercial commodity that should be allowed to develop through the demands of the market forces? Or is it a key service that – like the postal service – every citizen has a legal right to access? In a recent opinion poll commissioned by the BBC, 79% of the respondents across 26countries considered it to be a fundamental right. “Some worry that an increasingly commercial internet, and increasingly congested networks, will afford no space the next time demonstrators for democracy in countries such as Iran try to use digital technology to communicate their efforts and sacrifices to the world,” says Neelie Kroes, vice president of European Commission for Digital Agenda. Some see the increasing use of traffic management as a threat to the spirit of internet and the innovation it brought with it. “The consequences of a world without net neutrality would be devastating,” said a spokesperson for pressure group Save The Internet (www.savetheinternet.com). “Innovation would be stifled, competition limited and access to information restricted. The question, then, is whether governments should legislate to ensure that the internet presents a level playing field for both businesses and customers, and is equipped to cope with innovation. The stakes couldn’t be higher. “Broadband is a tipping point,” said the former Prime Minister, Gordon Brown last year. “High-speed internet access will soon be essential for everyone. Only a digital Britain can unlock the imagination and creativity that will secure for us and our children the high-skilled jobs of the future global economy.” Understanding your power to choose begins with understanding what traffic management measures your ISP already implements, and whether this provides you with the level of service you want. The internet has become a global resource, and so far it worked under an informal assumption of net neutrality. In the future, internet access will be a balancing act between the demands for bandwidth and profit motives of the companies able to grant or deny access. As consumers, our most effective means of telling ISPs what we want me is how we spend our money. As far back as 2005, rumors surfaced that Google was exploring ways to create an alternative internet using something called dark fibre. This is a dense network of fibre-optic links that over-ambitious telecommunications companies laid down across the US in the late 1990s in preparation for the coming internet boom. With the dot com crash of 2000, however, investment in new fibre-optic network all but ceased, and the thousands of miles of fibre that had been laid were never used. It was left “dark”. Google has been very busily buying up thousands of miles of dark fibre across the country. In February 2010, the company’s purpose for this redundant cabling became clear. “We are planning to build and test ultra high-speed broadband networks in a small number of trial locations across the United States,” said the company in a statement. Google’s plan in impressive. “We’ll deliver more internet speeds more than 100 times faster than what most Americans have access to today.” It will initially offer 1Gbit/s broadband connections to 50,000 homes, rising to 500,000. Google’s stated aim is to free innovators from fear that their applications might have mandatory bandwidth management applied or even blocked completely. We want to see what developers and users can do with ultra high-speeds, whether it’s creating new bandwidth-intensive ‘killer apps’ and services, or other uses we can yet imagine. way,” says a spokesman. It remains to be seen whether this network will link with the rest of the internet at similarly fast speeds as the will cost Google substantial fees to other ISPs.